Mister Rogers arrives with a letter he received from Mr. William Bolger, the Postmaster General of the United States. Showing the postage stamps, Mister Rogers explains that it costs money to send mail and invites viewers along as he visits Mr. Bolger to see how stamps are made. At Mr. Bolger's office, Mister Rogers talks to him about being the Postmaster General and his interest in the postal service. Mister Rogers is then introduced to Gordon Morison and Clarence Holbert who show him how stamps are made. Mr. Holbert shows how they are designed and Mr. Morison shows how they are printed. Back at the house, Mister Rogers shares that it is quite warm that day. Checking the temperature on a thermometer outside the front door, he finds that it is 85 degrees. In the Neighborhood of Make-Believe, it is very warm and everyone is doing their best to stay cool. Handyman Negri stops by the castle with a copy of the Neighborhood Annual Report which shows how tax money has been spent. At the oak tree, Henrietta Pussycat offers to make a pitcher of lemonade as Mr. McFeely delivers a package to X from the Owl Correspondence School. Inside the package is a money purse with a 10 to be spent "the best way you know how." At the Museum Go-Round, Lady Elaine and Harriett Elizabeth Cow are preparing to paint the Museum grounds but find themselves short of paintbrushes. Just then Handyman Negri drops by with a copy of the annual report and Lady Elaine is very intrigued to find that the Neighborhood has an excess of funds in the amount of 3,000. At the clock, Daniel is resting as Handyman Negri delivers his copy of the report. They look at a few pictures in the report and Daniel reveals that he is in the early stages of building a sailboat. Over at the castle, Lady Elaine is visiting King Friday to ask about using some of the excess funds to buy some paintbrushes. King Friday receives an interesting phone call and hints that the excess funds are already spoken for as he has plans to build a pool in the Neighborhood of Make-Believe. 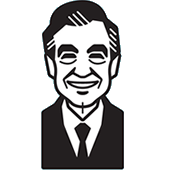 Back at the house, Mister Rogers talks about taxes and how tax money is spent on schools, roads, clean water, etc. In the kitchen, he draws a rainbow and sun on a piece of construction paper with crayons. According to the Neighborhood of Make-Believe Annual Report, a grand total of 156,970 was spent in the Neighborhood. Included in that amount was 12 for tree service and 16 for leaf assignment. William Bolger passed away in 1989 at the age of 66.